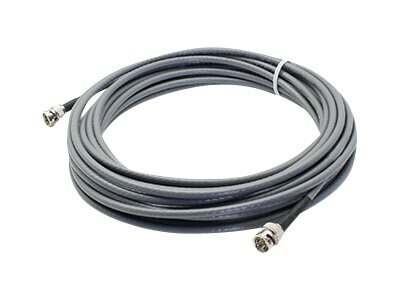 This is a 15m BNC (male) to BNC (male) black coaxial simplex plenum-rated copper patch cable. A coaxial cable is used for carrying lower-frequency signals, in which the dimensions of the cable are controlled to give the precise, constant conductor spacing which is needed for it to function efficiently as a transmission line. This plenum-rated cable is the only cable allowed in spaces defined as air plenum-rateds, such as raised flooring systems and air handling ducts. plenum-rated cables must self-extinguish and prevent re-ignition. A simplex cable is a single strand of fiber that works best with bi-directional transceivers as well as other single-transmitting devices. Our patch cables are 100% compliant for all of your networking needs. Our products are guaranteed by federal law to not affect or void OEM warranties.